When he started to make serious money he invested in real estate, his own restaurant, and an amusement park (Berry Park) in the St. Louis area. I can't think of any other early rocker who had the same business savvy. Later in the 60s and 70s, rather than play live with a band he’d have to pay, Berry toured solo and performed with whatever band was on the bill with him, which the promoter had to pay. Musician friends I’ve spoken to, who backed up Berry on these occasions, said he never rehearsed with the band beforehand but just went on stage and started playing. The band was usually able to keep up, however, given that most musicians were familiar with his canon of hits. Bruce Springsteen was one of those lucky musicians who once got to back him up. Not your easy-going dude to begin with, Berry was notoriously hard-nosed with promoters and booking agents and demanded cash for every performance—some of which went unreported to tax authorities, resulting in a four-month conviction for tax evasion in 1979. He certainly worked every angle he could to make and keep as much money as he could. But it was his artistry—his brilliant songwriting, musicianship, and showmanship—that made him the legend that he is. 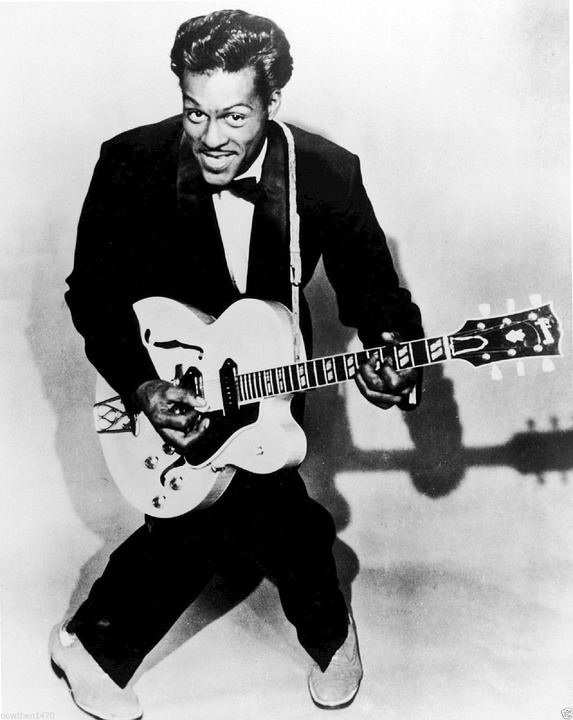 If someone builds a Mount Rushmore of rock & roll, Chuck Berry's face will be on it. I've heard negative stories about his business practices. Maybe it's disruptive to get paid on time and in full. I didn't see enough concerts when I was young, but I got to see Chuck. Where and when did you see him? Details, please! Grad night at Disneyland in late 76 or early 77, I forget. I think my girlfriend was with me, but since she dumped me for my best friend that spring, maybe I'm misremembering things. For years, though, when my older brother would start lording it over me in his condescending big brother tone I'd blurt out "I saw Chuck Berry live" and he'd walk away grinding his teeth. I don't know why it worked so well, but I milked it. Seems like the old guard is getting so much per ticket that they'll all be dead before I can save up the $300 it'd take to see them with Best Beloved. So, we hit the Helio Basin Brewery for the best food on earth every time Sugar Still is in town; we go to Third Place Cup to see Aubrey Rae on a Friday night once in a while, and hope that Eilen Jewell comes through before she's so famous I can't afford tickets. The economies of live music are screwed up bad. Psychologists say to buy experiences, not things, but when I can get every album U2 ever did for less than the cost of seeing them from a thousand yards away in a giant arena, it's hard to rationalize. Well said (per usual). Hey, have you ever thought of becoming a writer? Hey, have you ever had that thought? Chuck had the same attitude as the Chess brothers did when they signed him to Chess Records. Music is first and foremost a business. And he knew it would be good business to write about things that middle class white teens could relate to. Ka-ching. Indeed. Part of his genius was that, from what I've read, so many young folks thought he was white because he knew exactly what they were thinking. Know your audience. True enough. You could also say Dostoyevsky wrote novels for money. Doesn't diminish the artistry involved. The psychology is to focus on the art while you make it, and focus on the business before and after. It's only when you're thinking about money while pretending to be creative that things get wonky. Your overlooking his criminal record. He did jail time TWICE. Fair point. I made a slight tweak to my post. Chuck certainly did have his run-ins with the law. The most controversial was in 1960 when he was tried and convicted in 1960 for violating the Mann Act (transporting an underage girl across state lines for immoral purposes) but the conviction was successfully appealed on the grounds of prejudice by judge and jury. He was tried again (!) and eventually found guilty, serving a year and a half in prison. Lots of controversy surrounding the trials. Sounds to me that he was convicted of DWB (driving while black). That experience fundamentally changed him, according to some friends, and certainly interrupted his commercial momentum. His career never seemed to get back on track—despite his recording of gems such as "You Never Can Tell," "Nadine," and "Tulane" and the success of the Stones and Beatles which brought a new audience to his songs. He finally had a hit with "My Ding-a-Ling" in 1972, but it wasn't a rocker and apparently not written by him. The New York Times summed it up well: "Mr. Berry invented rock as a music of teenage wishes fulfilled and good times (even with cops in pursuit)." But I'm not nominating him for statesman. I'm nominating him for "Father of Rock & Roll."